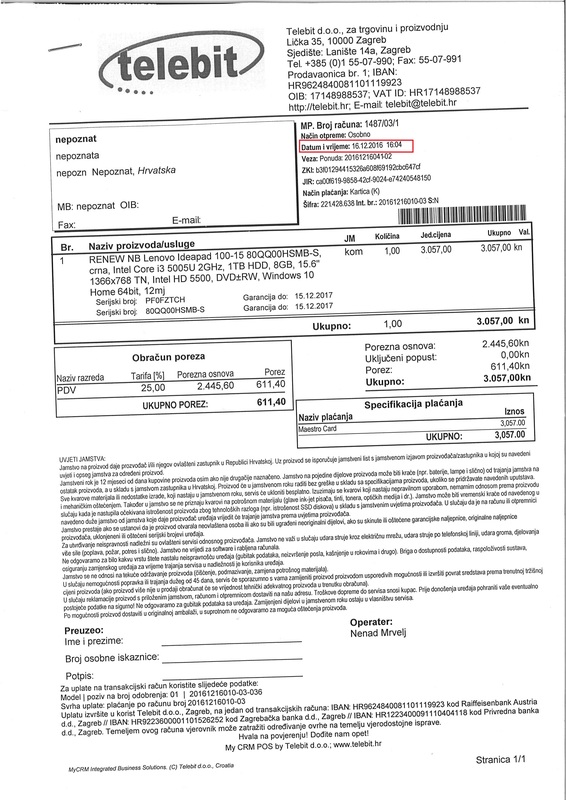 Bezobrazluk ovlaštenog Lenovo servisa – trust in Lenovo seriously shaken | Nelandir's Independent Trading Co.
Ispričat ću vam priču jednu o bezobrazluku, nesposobnosti i neprofesionalnosti Zel-cosa, ovlaštenog Lenovo servisa. Bit će dovoljno da ovdje zalijepim email koji sam poslao Potrošačkom kodu. ovim putem Vam želim ispričati svoje iskustvo sa servisom Zel-cos.
Riječ je o ovlaštenom Lenovo servisu. Lani sam kupio Lenovo laptop kojemu se pokvario bluetooth. Malo radi, malo ne radi, ali više ne radi. Budući da mi se približavao istek garantnog roka, odlučio sam laptop dati na servis. Kako vidite na radnom nalogu servisa, dobili su laptop 6. prosinca 2017. Na računu vidite da je laptop kupljen 16. prosinca 2016., odnosno da su ga primili unutar garantnog roka. 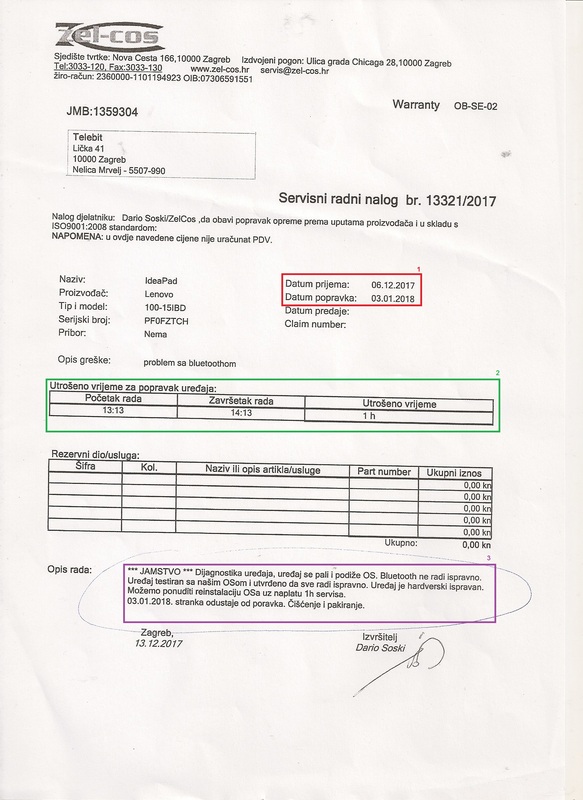 Međutim, vraćen je prekjučer, 3. siječnja 2018.; odnosno nakon garantnog roka. Kod njih je proveo skoro mjesec dana, a oni su na njemu radili jedan jedini sat, kao što vidite u radnom nalogu. Što su napravili u tom vremenu? NIŠTA, kao što vidite u opisu rada. Da su radili na njemu malo više od sat vremena, možda bi i sami primijetili da bluetooth radi na preskokce. Ja sam doma potrošio pola dana pokušavajući pokrenuti bluetooth na Windowsima i Knoppixu. Nadalje, smo u trgovini gdje je kupljen, potrošili dodatnih dva sata u jednom danu (duplo više nego Zel-cos u 28 dana). Isprobavali smo bluetooth na Windowsima i Ubuntuu. Zato se pitam koji to moćno operativni sustav oni imaju da im je eto sve besprijekorno radili. Također, reinstalaciju originalnih Windowsa u svrhu popravka u garantnom roku bi oni naplatili i to kao rad od sat vremena. Možda nekom neupućenom mogu prodavati te fore, ali ja znam da reinstalacija Windowsa traje uvrh glave pola sata. Ne znam, valjda bi si udvostručili trud… Ono što je bezobrazno bez obzira na naplaćivanje u garantnom roku i dodavanju potrebnog vremena je da me nisu kontaktirali da me pitaju da li da nastave. Ne znam, svi golubi pismonoše su očito bili prehlađeni 28 dana kad mi se u tom vremenu nisu javili… Ne, nego bi ja ponovno trebao dati laptop njima i dati im blagoslov za reinstalaciju. Praviti budale od ljudi i tjerati ih da bez veze hodaju po gradu je dovoljno bezobrazno. Uz to, ja sam osoba s invaliditetom i nije mi lako ići lijevo-desno po Gradu ko zadnja budala. Naravno, budući da je garancija istekla, čak i da ponovo ostavim laptop u njihovim brižnim rukama, popravak bi morao platiti. I koliko bih čekao?! Do lipnja bih možda i imao laptop u rukama! Prilozi: račun laptopa i radni nalog Zel-cosa. Before pasting the email, lemme tell you that I couldn’t find a Lenovo Customer Support email address anywhere; neither could I find a way to send them a ticket considering the (un)satisfaction with one of their authorized repair shops. That has shaken my trust in them because a global company like Lenovo should make it as easy as possible for their costumers to communicate with them. In the end, I Googled out five different Lenovo email addresses and sent them the same email hoping that at least one of them would respond. Firstly I would like to apologize for contacting you in this manner. I searched for a Lenovo support email contact, but was unsuccessful and found only these addresses. I figured that at least one of you is going to take action. Long story short: An authorized Lenovo repair shop received a laptop on 6 December 2017, returned the laptop on 3 January 2018, spent a single hour “repairing” the laptop and did nothing in that hour. The repair shop in question is Zel-cos. Since they are the only authorized Lenovo repair shop in Croatia, at least for Ideapad laptops, most broken Lenovo products in Croatia, especially those under warranty, eventually end up in their incompetent hands. To save myself trouble of dealing with them again, I am never going to buy a Lenovo product again and I am going to spread the word to save other people the trouble of dealing with them. Device has been tested on our OS and it has been established that everything functions correctly. Device’s hardware is sound. We can offer a reinstallation of the OS for additional payment of 1 hour of work. The bolded text is the diagnostic of the shop where the laptop was bought. We spent two hours (double the time than the repair shop) in a single day (27 days! less than the repair shop…) trying to make the Bluetooth work without success. Only then did we send the laptop to the repair shop. *Note that they hadn’t repaired anything, but they had kept the laptop with them for a month. The problem with Bluetooth is that it doesn’t work most of the times. If they had actually spent more than a single hour “working” on the thing in 28 days, they might have noticed that themselves. Upon confronting them with that argument, they had the audacity to tell me that “if a device works sometimes, it isn’t broken”. I also bolded “payment”. They request I pay them for repairing a device under warranty and they said it would take 1 hour?! A full hour for OS reinstallation?! 30 minutes tops! However that is not the point. The point is that they didn’t contact me to ask me if I wanted them to proceed. I guess all the carrier pigeons must have been unavailable for 28 days, so it must have been just impossible for them to contact me… I would also like to add that I am a person with disabilities, so while making people walk around the town for no reason is bad enough, walking around the town really is difficult for me. Moreover, I didn’t drop anything; I hadn’t even been told anything before being handed the laptop back. Before moving to the issue of warranty, I would like to say that the Bluetooth was tested on Windows, Ubuntu and Knoppix without success. So I do wonder what mighty OS the repair shop uses. Upon asking them the question, I wasn’t given an answer. I attached the receipt of purchase as a proof that when the laptop had been received, it had been under warranty. However, The warranty expired in the mean time. This was most likely done so I couldn’t intervene on a free repair anymore. So, while the warranty is not valid any longer, it expired on 16 December, meaning the laptop was under warranty when the repair shop received it (6 December). I would like to end the email with saying how very disappointed I am with Lenovo. I never expected such an established brand to authorize such a rude and incompetent repair shop. This entry was posted in All kind of crap, English, Hrvatski, Warrning and tagged athorised repair shop, authorized repair shop, lenovo, ovlašteni servis, zel-cos on Fri, 5 Jan 2018 by Neustrašivi Nel.